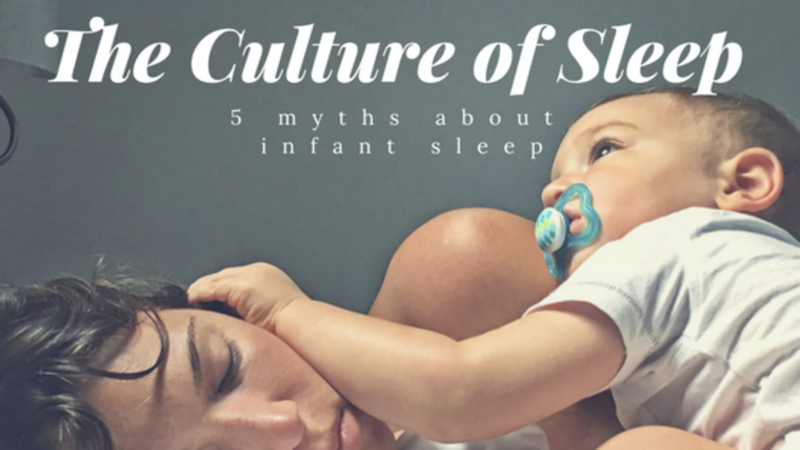 The Culture of Sleep Myth #5: If you help a baby sleep, they will always need help. As Americans we're obsessed with independence. We believe in being self sufficient and doing it on our own. This spills over into our parenting values in many way. The first way our individualist values show up, is in the goal of getting baby to fall asleep without help. Then to stay asleep alone. The importance of teaching a baby to self sooth is advocated almost as soon as they are born. Our babies must learn to be individuals, and the sooner the better. Not all cultures see a need to push babies toward independence. In collectivist cultures, the infant is seen as an individual who needs to be made into a member of the community. These cultures are driven to keep babies close at all times, including during sleep. In Bali, a baby is held continuously until they are 6 months old. They are not alone in the belief that small infants should be held all the time. Our cultural push towards falling asleep without help has led us to a very strange leap in logic. It has been decided the only way an infant can learn to be an independent sleeper is to get rid of any support. Because support means dependance. This logic assumes that helping a child learn a skill is somehow the wrong way to encourage growth and development. Helping a baby to go to sleep takes many forms. As a parent we nurse, rock, bounce, walk, pat, rub, sing to, wear, push in strollers, and drive around as a way for baby to either get to sleep or stay asleep. These ways of helping are often a part of the daily flow. Sometimes they are used in moments of exhusted desperation. Parents, however, are told they are creating bad habits, and dependance, by doing any of these to help their infants sleep. Nursing seems to have the worst reputation for creating a negative sleep association. If you let a baby fall asleep nursing, they will always need to nurse to fall asleep. From a safety and biological perspective, nursing is one of the best places for a baby to fall asleep. The rhythmic sucking regulates the nerves system, allowing for better and safer sleep. Filling the belly before sleep allows for a baby to sleep longer before needing to eat again. The hormone release for both mother and baby are sleep inducing. Any nursing parent can tell you how sleepy you get when you are nursing. All these affects, help baby sleep better. Yet it is seen as a bad habit. If we apply this idea- support creates bad habits- to any other form of development, the argument falls apart. We would never say, "If you hold your child's hand when they are learning how to walk, they will never learn to walk alone." The support and help we give by holding their hand is seen as a way to encourage the development of independent walking, not hinder it. The development of learning to consolidate and sustain sleep is the same kind of skill. Moving from wake to sleep independently is partly development and partly practice with support, just like walking. So many of the parents who end up in Sleep Group talk about the need to teach their baby to self sooth. Self soothing it touted as the key to getting a baby to sleep though the night. The thing is, infants can't self sooth. It is a physical impossibility. They can learn to stop crying, but they are unable to bring their brain out of distress without the help. There is actually a cell in the brain with the task of handling stress. These cells develop with age, and until you have enough you can't bringing yourself out of distress. Research has shown young children don't have enough of these cells until they are 5 years old. This means until children are 5 years, they require the support of an adult to bring their nervous system out of distress. I would really like to change self soothing, to self maintenance. An older infant can learn ways to prevent distress from happening. Some infants will use tools or props to help them maintain calm. This could be a pacifier, a lovey, or a blanket. Often you will see an infant or toddler use a repetitive behavior, like rubbing the sheet, twirling their hair, or tapping a foot to help them stay clam while falling back to sleep. It would be much better to focus on helping a child learn to stay calm, instead of leaving them to try to calm down once they have hit their limit. Yet, self maintenance is still a skill that has to be practiced -with support. A more important habit to worry about is the sleep cycle patterns. Our brains likes patterns because they make the brain's job easier. When an infant is learning to sleep, how we support them will teach the brain the patterns it should create for the cycles of sleep. We all move through light and deep cycles while we sleep. Light sleep, for a very young infant, is a very active neurological state. This active light sleep can cause the baby to wake, especially if they are not given support. Our belief in the need to make babies self sooth and go back to sleep without support, makes us leave babies alone in this light sleep. A parent waits to see if baby will go back to sleep alone. Usually, resulting in a baby who wakes up. Once awake, it is much harder for baby to go back to sleep. On the other hand, if we give a baby support when they are in light sleep, they stay asleep. Without help the pattern becomes, deep sleep-light sleep- wake. With help, the pattern becomes deep sleep-light sleep-deep sleep. Even when a baby needs to nurse to go back to sleep, if you get them before they wake up, they learn to go back to sleep. So when the food is no longer needed, they just stay asleep. Habits do form and can at times cause problems. Yet our cultural idea of habits around infant sleep suggests habits are bad and can never be changed. We all know this is not true. Bedtime routines can create really important habits to help support sleeping well. Habits are also not permanent, they can change and can change quickly. Infants are in a state on constant change. Abilities and sleep needs go through major shifts in the first year. So any thing do with your 3 month old is going to very different from what you do with your 9 month old. Because infant change so much, habits can be created and broken in a week, or less. The main point, is mostly to stop worrying about what sleep is going to look like down the line. You don't know what is going to come up between now and three months from now. You want to support your child's sleep where they are right now. Do what works right now. When it stops working, you can change it. I can't wait to send you amazing things! Thanks for joining the list!